Marian to Exhibit at Strategies in Light Show 2018 - Marian, Inc.
Marian Inc. will be visiting Long Beach, CA to exhibit at the 2018 Strategies in Light Show. Join us from Tuesday, February 13th – Thursday, February 15th to take a first-hand look at our die cut offerings for LED/lighting applications. 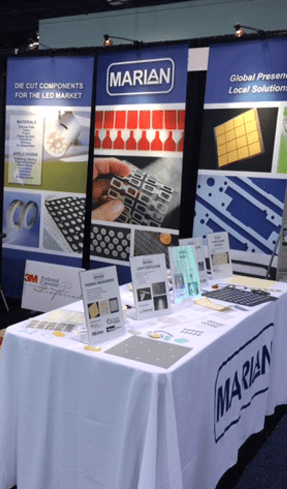 Stop by booth #629 to learn about Marian’s capabilities and see how we can help you with your LED/lighting applications including solutions for thermal management, sealing, light reflection & diffusion, venting, and more. Take a look at the full floor-plan and make sure to stop by to talk with us. We’ll have tons of samples on display, literature to send with you, and our experts will be ready to answer your questions. Click here to reserve your FREE spot and learn more about attending this year’s show. We look forward to seeing you and learning how Marian can help you with your solutions! If you’re interested in learning more about Marian’s capabilities, get in touch with us here or give us a call at (317) 638-6525 and someone will assist you.